Antique Caucasian Karachopf rugs – Karachopf is the name of a rarer rug design categorization that’s widely known. The antique Karachopf rugs are also associated with masterful Armenian rug weavers who resided in the Caucasus Mountains region. Superb antique Caucasian Karachopf rugs are eye catching Oriental carpets that hail from the nineteenth century. Due to their relative rarity many rug enthusiasts and carpet collectors of antique rugs tend to be quite eager to get their hands on them whenever possible. 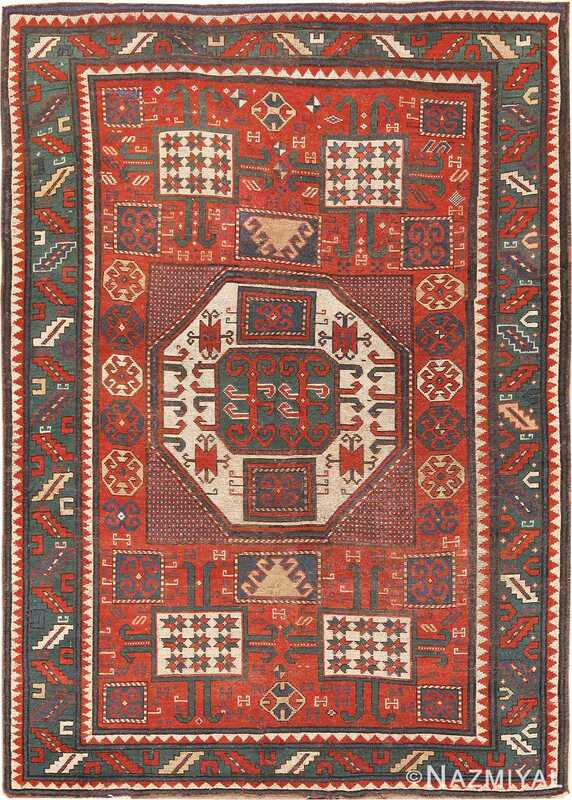 Particularly distinctive antique Caucasian rugs that are part of this general category tend to feature geometric medallions and designs that are shaped like rectangles or octagons. They display “Ram’s Horn” and “Star of Wisdom” patterns. These geometric design patterns are, by design, not completely even or even balanced in appearance. The sides of these Kazak rugs tend to be rather minimalist in vibe. They often have angular and primitive designs, too and in some cases, feature stars or arrows of sorts. Five star antique Caucasian Kazak Karachopf rugs offerings are beloved by many thanks to their first rate wool and fascinating tribal designs. People tend to be drawn to their rich color schemes as well that frequently feature radiant blues and other jewel tone rug color variations. The Karachopf Kazak rugs are a lovely esteemed gems . They are coveted among individuals who are passionate about acquiring and collecting antique Caucasian and tribal rugs. The antique Caucasian Karachopf rugs have been around for more than 150 years and have a dense pile that’s worth noting. Many of the Karachopf rugs are associated with a cruciform mandala patterns that bring a lot of mystery to the table. People who view these tribal gems are often enthusiastic about their colors and patterns. The while the main Karachopf patterns are quite recognizable, the small variations within the accent design patterns if where you can see just how creative many of the weavers were. People who are familiar with the Karachopf rugs are constantly looking for interesting and unique examples. These breathtaking antique tribal rugs are as engaging as any of the other great tribal works of art. People who are looking to acquire beautiful tribal antique rugs, that are fascinating, will often set their sights on the fascination antique Caucasian Kazak Karachopf rugs.